Observers say it's because that's when President Trump's son-in-law, Jared Kushner - an observant Orthodox Jewish man - is off duty, marking the Sabbath. Mr Kushner, the husband of the first daughter, Ivanka, is a power in the land, the crown prince. Because of his semi-public power struggle with Steve Bannon, he's seen as an enemy by the hard, nationalistic right. But what drives him? What does he believe? And how could that change the world? The provocative conservative commentator and early Trump supporter Ann Coulter - author of Adios, America: The Left's Plan to Turn Our Country into a Third World Hellhole - told me the suspicion was not personal. "You can't hire your kids," she said. "They can't be fired, they are more than first among equals. "It's a Third World thing to get elected and bring in all of you family. "It's what they do in banana republics." And this story is all about family, dynasty and destiny. "J-Vanka" - their couple name - provides a soupcon of sophistication, implying smoothly groomed beautiful youths in a court that is more King Midas than Camelot. While Trump Sr starred in the downmarket tabloids, they have been a fixture of the glossy magazines. Last year, Elle Decor gushed about the couple's Upper East Side apartment, and its Lindsey Adelman light fixtures and candlesticks by Jeff Zimmermann. The room in black and white - with just a hint of imperial purple - is cool, understated. So are they. In the White House, amid the balding billionaires - and a leader who made vulgarity a virtue - their sleekness stands out. Lizzie Widdicombe, an editor of the New Yorker's Talk of the town, watches them closely. "They both have a noticeable level of polish," she says. "It is often said that Ivanka softens the brash, abrasive image of her father and makes it palatable." I ask if Jared does the same thing politically. "That's a great way of putting it," says Widdicombe. "He has been the link to Wall Street, and Rupert Murdoch, who he's cultivated as a close personal friend, so he has emerged as a powerbroker." The president and his son-in-law are both what's known as "bridge and tunnel guys" - President Trump from the outer borough of Queens, Mr Kushner from out-of-state New Jersey, each well versed in making a splash in the magic kingdom of Manhattan, turning grit to glitter using the glamour of gold. And there's a hint of resentment in both of them, sharpened by Mr Kushner's background. He's not just a property billionaire. He's not just the son-in-law of a property billionaire. He is also the son of a property billionaire - a property billionaire who went to jail. It was ugly - a family feud that went nuclear. As the row spiralled, Jared's father, Charlie, was jailed for tax evasion and deception. Jared's close friend Ken Kurson, editor of the New York Observer, told me the trauma had been the making of him. "This is a guy who at 24-25 was made chief executive of a giant sprawling complex company," said Kurson. "He not only handled that in an emergency, but grew the company. "To step into a world of grizzled real estate guys, treat them with respect but also lead, was a truly astonishing feat." Gabriel Sherman, who wrote an early profile of Mr Kushner for The New York Magazine, agrees with Ken Kurson's analysis. "Without question, it is still the defining moment of his life," he told me. "Growing up, the family always thought he would run for political office and become a major figure in America, but much further down the road. "When Charlie went to prison, Jared was required to start that climb to power at much earlier age. "That was traumatic, but he also seized his opportunity." According to one profile, friends say Jared's father, Charlie, is mostly a charmer - but can also be volcanic and irascible when crossed. "Charlie is a really aggressive, flamboyant, high-profile figure a lot like Trump," says Lizzie Widdicombe. "Being the son or daughter of a person like that is a very specific experience. Jared is the Trump whisperer." But what does he whisper? Probably a more pragmatic, more cautious, more mainstream Republican view than President Trump's own. One of my sources said he'd reflect the views of his New York friends who "hate Trump". To some on the hard right, he is the swamp President Trump promised to drain. Ann Coulter feels the will to power may outweigh any ideology. "I think he wants to help his father-in-law," she says. "It'll be embarrassing to be the son-in-law of a failed president. "That's the good part of it - and it's very clear how his father-in-law can succeed or fail. "If he keeps his promises, he'll be the first president we've had in a long time who didn't just break all his promises. "He will not succeed unless he keeps his promises on immigration and trade." In his old office, Mr Kushner kept a picture of President John F Kennedy addressing a crowd, from the front, and from the back. He is still in the backroom, not in front of the crowds, portrayed by Saturday Night Live as a preppy mute. He may not speak in public - but when he whispers, President Trump takes notice. Watch him closely to learn what the president will do next. 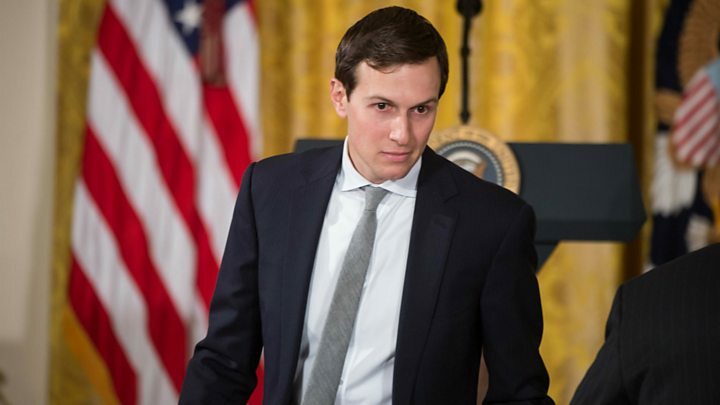 Listen in full to Mark Mardell's profile of Jared Kushner on BBC Radio 4's PM programme.